Here’s your chance to meet American singer Ariana Grande! Enter the Cosmopolitan Ariana Grande NYC Getaway Sweepstakes by registering online at Cosmopolitan.com/ArianaConcert and you could win front row concert tickets to her Dangerous Woman Tour in New York City. One lucky fan and a guest will be sent on a trip to New York, NY to see Ariana Grande in concert on February 24, 2017 at Madison Square Garden. The trip includes round-trip coach air transportation, 2-night hotel accommodations in NYC, a pair of tickets to see Ariana Grande in concert, a meet and greet with Ariana and $500 spending money. Commencing on December 13th, go online to cosmopolitan.com/arianaconcert on a computer or wireless device then, follow the instructions to complete and submit the entry form. Upon filling in the fields, you will automatically get 1 FREE issue of Cosmopolitan Magazine and be entered for a chance to win. If you’d prefer to enter the sweepstakes without getting a free trial, click here. The Cosmopolitan Ariana Grande NYC Getaway Sweepstakes is open to legal residents of the 48 contiguous United States and the District of Columbia, who have reached the age of majority at the time of entry. This Cosmopolitan Sweepstakes is starting on December 13, 2016 at 12:01 AM. ET and is ending on January 31, 2017 at 11:59 PM ET. There is a limit of one Sweepstakes Entry per email address per day throughout the Sweepstakes Period. Winner will be selected on or about February 1, 2017 in a random drawing from among all eligible entries received. Total approximate retail value of the grand prize is $2,899.90. The Sponsor of this Sweepstakes is Hearst Communications, Inc., 300 W. 57th St., New York, NY 10019. 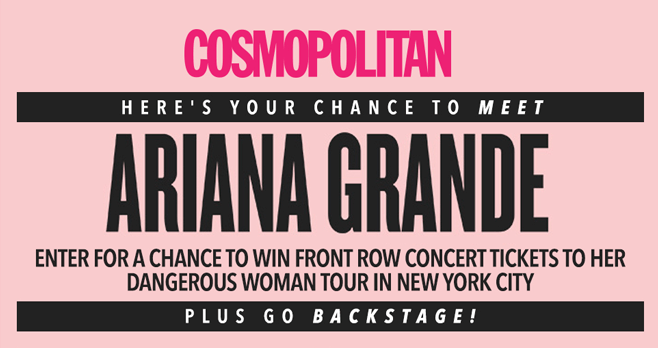 For complete details, including Official Rules, visit www.Cosmopolitan.com/ArianaConcert.